This entry was posted in wordpress and tagged blog, email. Bookmark the permalink. Trying to sort emails based on categories automatically using “keywords” within the title. Could use some help. When I send an email to postie, I want it to automatically assign categories based on the subject line. And I don’t want to have to include : or -. This is because the emails being sent are from a third party (a church) and their subject lines are always changing and the emails go out to multiple people and Postie is just on the address list. I want there to be two categories. Announcement and prayer requests. When they send emails I want them to default to the “announcement” category unless the subject line includes the words “prayer”, “prayer update”, or “prayer request”, then I would like it to go into the “prayer” category. How can I do this? This is what I have. The tags work, not the categories. I’ve found that $post[‘post_category’] needs to be an array of integers (category ids, specifically). You can use $post[‘category’] = array(get_cat_id(‘Prayer’)); To set it to the Prayer category. 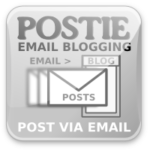 Hello, I am very effectively using postie to archive mailman lists and im able to have posts and comments onto the system using a rather insecure allow all to post comments setting. However, the issue i seem to be encountering is that every so often the order that comments are done goes haywire. Initially under latest comments i would get the comments in the correct order, however now the latest comments remain the ones that were latest two months ago and any new comments dont seem to show. Maybe the same holds for text left to a colon – we just didn’t have troubles with that yet. I LOVE Postie – Love it! It’s perfect for a project that I’m working on. I’m wondering if you can help me with something. Long story short, I can’t keep people from posting images and other code between those tags, all the other code in the email needs to remain, but I have to be able to filter out the > tag and the < tag, basically to teach them a lesson, but more importantly to stop them from sticking images and other odd code in the excerpts. Could you please tell me how I would do this?